A “Money” drink is something you can put in front of anyone, regardless of tastes or distastes about the spirits involved. Come up with a drink or a list based on spirits about drinks that would appeal to anyone. example: turning someone onto a Corpse Reviver #2 when they like lemon drops. Drinks that you upgrade to the ne plus ultra: cocktails that for whatever reason (holiday, birthday, old friends come to visit, or just because you feel like it) you upgrade to superior; for example, taking your normal Sazerac with Rittenhouse and Herbsaint and, for a special occasion, turning it into a supreme-o Sazerac by breaking out the Thomas Handy Rye and the Jade Edouard absinthe. Due to the higher cost involved, and the spectacular results that should (hopefully) be found in the glass, this could also qualify as a “Money Drink”. I hate it when the MxMo announcement post names the drink I’d most want to use, and in this case, Kevin hit my first choice for both versions. I have seen more than one “gin hater” realize the beauty of the spirit upon their first sip of a well-made Corpse Reviver #2. And one of my favorite recent indulgent cocktails was a Staggerac – a Sazerac made with George T. Stagg whiskey. The path of the ne plus ultra appealed more to me. We spirit geeks will often declaim that some expressions are just too precious to mix with. And then we give in, and make an old fashioned with a great sipping rum like Zaya Gran Reserva. After all, a drink is only as good as its constituent parts. I had the good fortune to time my first ever trip to Portland this past weekend during the annual House Spirits Booze Bazaar, and got to taste their three whiskeys. I couldn’t resist picking up a bottle of the whiskey in both the full cask strength (56.79% ABV/113.58 proof) and the subtler 44.99% ABV/89.86 proof version.2 I’ll be saving the cask strength for sipping, but couldn’t wait to mix with the whiskey. When I think of luxe drinks, champagne immediately comes to mind. Sparkling wine can make a simple combination like white wine and creme de cassis into a great sip like the kir royale. And while the Seelbach is the current newly rediscovered classic whiskey and champagne cocktail, I wanted to try something that let the whiskey express itself directly. I ran across a recipe that called for a bourbon champagne cocktail that replaces the sugar and Angostura bitters of the classic with vanilla syrup. But why use syrup? I decided to try Navan vanilla liqueur instead. I tried various combinations of too clever by half names, but decided to go with the most simple. 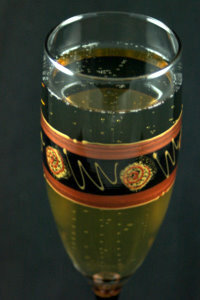 pour whiskey and Navan in champagne flute, top with champagne. Sip contentedly in front of a fire with purring cat on lap. This drink has the advantage of being incredibly delicious while being super easy to make. And so very luxurious. Thanks to Kevin for a great topic. Be sure to check out Beers in the Shower for the round up post! despite the fact that to date, I haven’t actually had him make me a drink yet. Must remedy that. Off to Tavern Law…or Spur…or Sun…the man can be found at some great bars! I realized after getting through the whole line and getting outside that I failed to buy the white dog as well.